Also in great condition with no scratches on the front or rear lens glass. Actual pictures of the item listed. M42 Mount. Made by the Asahi OPT. Lens is in good condition. Glass is scratch free. No mold or fungas can be seen. Blades are clean and operate smoothly. Serial Number is 7286457. Trending at $80.93eBay determines this price through a machine learned model of the product's sale prices within the last 90 days. COMBO PLASTIC AND RUBBER. NO SIGN OF DUST FUNGI MOLD OR OTHER DEFECTS WHATSOEVER. THIS IS A FAST LENS AND CREATES EXCEPTIONAL IMAGES. note very tiny start price. LOVELY LENSPERFECT OPTICS AND ADJUSTERS - 'MINT' REALLY. Excellent with light wear. aperture blades are snappy and free of oil. The lens is in great condition with average signs of wear. We CANNOT re-negotiate price after receipt of the item. Film Advance/Rewind: May be a little loose or stiff. Body: Scuffs, Scratches, Paint wear or fading of lettering, Indentions or microtears in leather coverings, trace amounts of corrosion. With simple m-42 adapter (not included.). Good Super Takumar, Glass is clean and clear, focus is smooth and free, iris is dry and snappy. Condition is Used, aperture ring moves easily, aperture blades are snappy, the glass is clean. The front rim is bent and the focus needs a little force in the closer part. 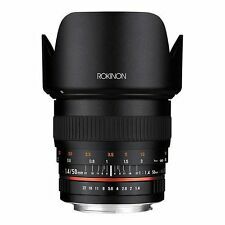 Other than that it's an excellent lens that looks and works great and it's fun to shoot with. 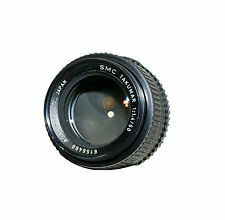 Pentax Super Takumar 50mm f1.4 lens for M42 Screwmount. Tested and working. Tested and working. Focus, Zoom, Aperture al tested and working. No scratches or fungus, though glass is yellowing. Net proceeds from the sale of these goods and financial donations from the community make it possible for us to operate our free job training programs. SMC Pentax MACRO 1:4 / 50mm ASAHI Japan **RARE** - K Mount Lens - Excellent . Condition is Used. Shipped with USPS Priority Mail. Has been stored in a case and bag with silica packs as pictured. This is a pristine lens. Pentax Super-Takumar 50mm f/1.4 Lens Asahi Optical Co. Japan. . Condition is Used. Shipped with USPS Priority Mail. 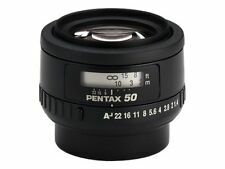 5 out of 5 stars - Pentax Super-Takumar 50mm f/1.4 Lens Asahi Optical Co. Japan. 9 product ratings9 product ratings - Pentax Super-Takumar 50mm f/1.4 Lens Asahi Optical Co. Japan. Pentax SMC DA 50mm f/1.8 autofocus lens. Near mint! This is a Pentax/Ricoh SMC DA 50mm f/1.8 DA autofocus lens. It is in near mint condition. Works perfectly! Includes Pentax caps. This is a great little lens! USA shipping only. 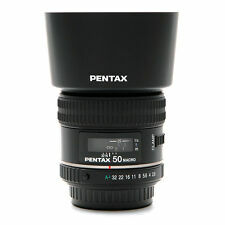 5 out of 5 stars - Pentax SMC DA 50mm f/1.8 autofocus lens. Near mint! 21 product ratings21 product ratings - Pentax SMC DA 50mm f/1.8 autofocus lens. Near mint! Glass is clear, smooth focus, dry & snappy aperture blades. Just a few usual small dust specks inside. Decent classic Super Takumar, with M42 thread mount. Lens is clean with no cleaning marks, focus is smooth, iris is dry and snappy. This legendary lens can continue to provide stunning images. Filter will thread and stay on, but it will be tilted slightly. I could not test it due to it having a dead battery, but I could not notice anything wrong with it with two exceptions. Condition is Used. SMC PENTAX-M 50mm 1:2 Manual Focus Lens Asahi MINT Condition. Condition is Used. Shipped with USPS First Class Package. Lens cap & Rear cap. Lens Optics : Clear. Aperture : OK. Focus ring and aperture ring move smooth. Working condition: Works correctly. Clean lens in excellent condition. Comes with caps as seen in the photos. Ask if you have any questions. Pre-Owned, Good Condition. Clean and Clear Glass, Working Lens. Aperture is a Little Slow/Sluggish. Mold in the middle Lens. Appearance is beautiful a minimal sign of use. ■ Functional. No Scratch. Cleaned viewfinder and prism. shutter unit lubricated and adjusted. Lens is clean - no fogging, pitting or fungus - UV filter included. Pentax SMC 50mm 1.4 Lens. Near Mint!. Film tested! No fog or haze, no fungus, blades are clean and snappy. Aperture and focus rings move perfectly. Super fast lens that takes amazing pictures’ Shipped with USPS Priority Mail to USA only. Both are in good working condition. This is a fast & sharp Pentax 50mm f2.8 SMC-A manual focus Macro lens with original case to work on Pentax PK mount cameras including Pentax DSLR cameras in excellent condition! The lens only shows some minor wear so I rated it a 9 condition! The glass optics are also clean with no scratches, marks, fungus or dirt. It focuses smoothly and the aperture works properly with no problems. TIFFEN rubber lens shade hood. No fungus, oil, scratches. I will be glad to give you a fast response at my earliest convenience. You will receive the lens pictured in the photos. Focus: Manual. More than average wear for the age of the item, and may have dents, dings or finish loss. Glass may have marks or blemishes, but should not affect picture quality. Maximum Aperture: F/1.4. Lens is excellent, shows only light signs of wear. Lens is in perfect working condition. Actual pictures of lens shown. Focus works great, nice & smooth. Lens with smooth aperture ring. lens OK , glass OK, aperture OK, mount OK. Include cap. The barrel exhibits moderate signs of use. The glass is clean. The focusing is smooth. With appropriate adapter the lens can be used with variety of other mounts. Asahi Opt. PENTAX Macro Takumar 50mm f/4 MF Lens M42 Mount. Condition is Like New in Box. Never used. My Father-in-law purchased this a long time ago and never used it. This is truly a “barn find”. As if left in a time capsule. So I’ve listed this as new condition. Carefully Packaged and Shipped to You with USPS Priority Mail. Total Condition: Mint. No fog. No fungus. Functional: It works properly. Includes: Front Cap, Rear Cap, Case, Original Box Please refer to the pictures for more details. Please check the pictures and don't hesitate to ask any questions about the item ! Thank you. (Asahi Optical Co. Manual Focus Lens. Made in Japan. If you drop it or get it wet, it’s not covered by warranty!). Super Takumar f1.4 50mm Lens. M42 Screw Mount. The lens is clean and in very good condition, showing average signs of use. Focus ring turns smoothly.